Over the last few years, there has been a media frenzy over the use of children as fighters, executioners and suicide bombers by Daesh—also known as the Islamic State. These children are often now dubbed as the “Cubs of the Caliphate”, and child protection advocates are increasingly challenged regarding how to help them. While the use of children in war is of course nothing new, the deliberate use of very young children in propaganda videos and on social media is a shift from typical patterns of child recruitment that we’ve seen in the past. Not only does Daesh not hide its use of very young children, as other groups have often done, but the group’s propaganda machine promotes and glorifies it. Child protection strategies and negotiations that may have worked in the past —such as negotiating releases, creating demobilization programs, or naming and shaming—seem very unlikely to work here. Indeed, the UN Secretary General on Children and Armed Conflict noted in this year’s report that the regular use of social media to recruit children and young people is “a new and compounding challenge”. While we might be appalled at these tactics, we certainly should not be surprised—defying the existing international order has been the Daesh strategy from the beginning; why should child protection norms be any different? Yet, even the most notorious child recruiters in recent memory, such as the Lord’s Resistance Army (LRA) in Uganda and the Revolutionary Armed Forces of Colombia (FARC), paid some lip service to international human rights law, such as hiding the level of children involved, claiming that their fighters were over fifteen, or negotiating with child protection agencies to release at least the youngest children. Indeed, the 2015 Annual Report from the United Nations Secretary General on Children in Armed Conflict notes that due to “strong engagement” with armed groups, over 8,000 children were released across Africa, Latin American and Asia in that year. But Daesh quite clearly doesn’t care what the UN has to say, and it is deliberately using children as a tool of propaganda—quite an effective tool, judging by the extensive media coverage. 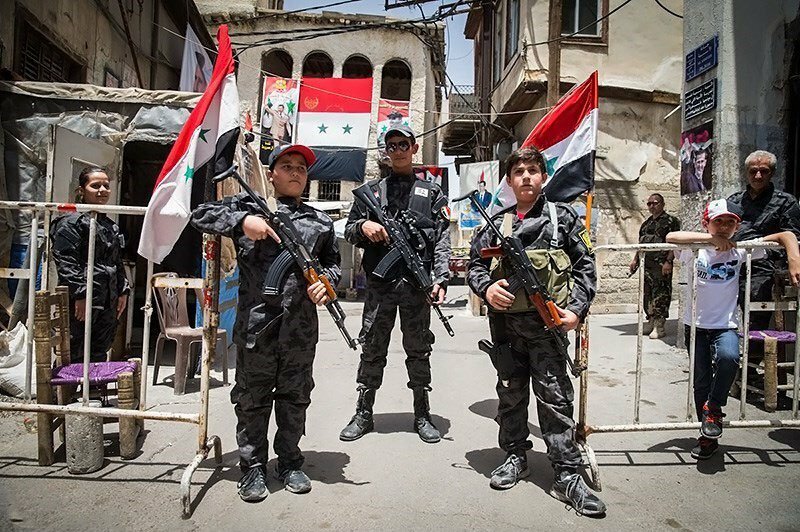 As Mia Bloom points out, there is plentiful evidence that other armed groups in Syria also use children—they just don’t advertise it; perhaps because they know that international law matters, especially when it comes to being funded by Western countries. The 2016 report from the UNSG on Children and Armed Conflict states that of the verified child recruitment cases in Syria, 56% were under 15, a “significant increase” since 2014—the highest number of verified cases being children recruited by Daesh. In fact, in 2014, the Free Syrian Army declared that they would refrain from recruiting children and otherwise using children in hostilities—lip service, at least, to international law, though the announcement conveniently made no specifications as to what age qualifies as a “child”. In contrast, Daesh appears to be intensifying its propaganda involving children, making sure that everyone is still paying attention. It is, after all, very hard to ignore videos of children executing prisoners, or rows of young boys pledging allegiance to the caliphate. Even though the vast majority of children affected by war are not combatants, child soldiers are the ones that get headlines. Where does child protection go from here? The world cannot stop paying attention to these propaganda videos—ignoring them is unlikely to stop what’s going on and may inspire even more graphic and attention-grabbing material to bring the spotlight back around. But the UN and other child protection organizations have little to no access to many of these children, and even if they did, negotiation with those in charge appears to be impossible. So many aid groups have to simply wait—until opposition forces move in, until families get out, until something significant shifts. When child protection agencies can’t get children out, their focus often moves to stopping minors from joining in the first place. Unaccompanied children are often at highest risk, so reconciliation efforts and child tracking mechanisms continue to be critical. When poverty is a push factor for joining, as has been the case in many conflicts, some of those elements can (potentially) be addressed with better and more targeted development assistance in certain countries, but this is not currently a feasible option in Syria. When children are kidnapped from refugee camps or other unsafe areas, again there is a role for child protection and better security, though it won’t always be effective—in June and September of last year, Daesh reportedly kidnapped over 1,000 children from Mosul district alone. To complicate matters, in some Syrian cases, the parents have been complicit in their own children’s recruitment, with children as young as eight or nine being involved in armed conflict due to family connections. Launching a counter social media strategy is certainly one option, showing the realities of the violence and abuse that children really face in war, which some videos have already done. Engaging with local communities where foreign fighters are being pulled to join Daesh is another strategy taking place in cities across the world, where young people are pulled in by polished recruitment propaganda. But when it comes to the children already there, no one seems to quite know what to do. Daesh is forcing child protection agencies to rewrite the playbook, but with what?